The Pars won a vital point in this 0-0 draw to edge just a little closer to St Mirren but they have now gone 8 SPL matches without scoring and this afternoon they only had one shot on target which is simply not good enough. 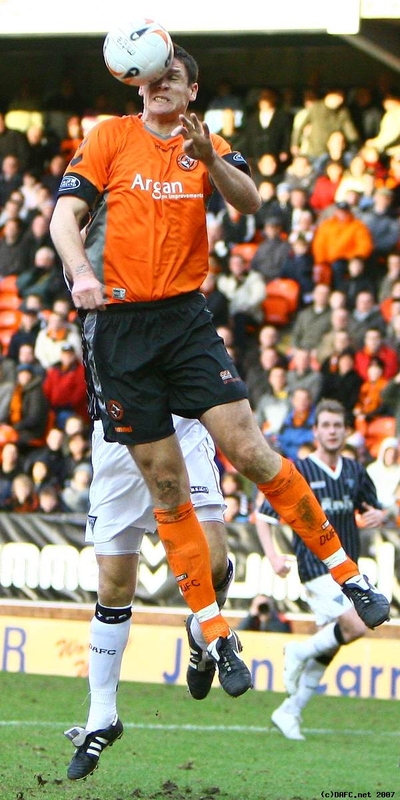 Stephen Kenny must have thought he had his most experienced team taking the field at Tannadice which meant Greg Ross, Scott Morrison and Adam Hammill all drop out of the starting line up. With Dorus De Vries in goal, Shields at right back, Wilson and McGuire in the centre back roles and making his debut Stephen Glass at left back. Stephen Simmons came back into midfield with Scott Muirhead, Gary Mason and Jim O’Brien on the right wing. Hamilton and Crawford led the attack. With a very good backing the Pars started the game but it was United that got forward very quickly. De Vries was called into action in 5 minutes with a very good save when Samuel was through one on one with the keeper. Duff then hit a good effort that De Vries punched out. It was proving to be a frantic opening with the ball flying back and forward and most often 10 feet in the air. There was a forced change in 12 minutes as Shields went off limping to be replaced by Ross in a straight swap. Ross slotted into the right back role and showed his confidence with a good header back to De Vries inside the 6 yard box. There was a bizarre moment in 22 minutes when a United throw was taken and the ball was played back to the thrower Kalvenes who allowed the ball to go out as he tried to play it down the line. Greg Ross rightly picked up the ball as the two United players had an “exchange” of words (and had stopped playing) then referee McDonald signalled a free kick for United for Ross handball the stand-side linesman had apparently indicated the ball had not gone out. The incident happened right in front of the Pars fans and the ball clearly crossed the line. 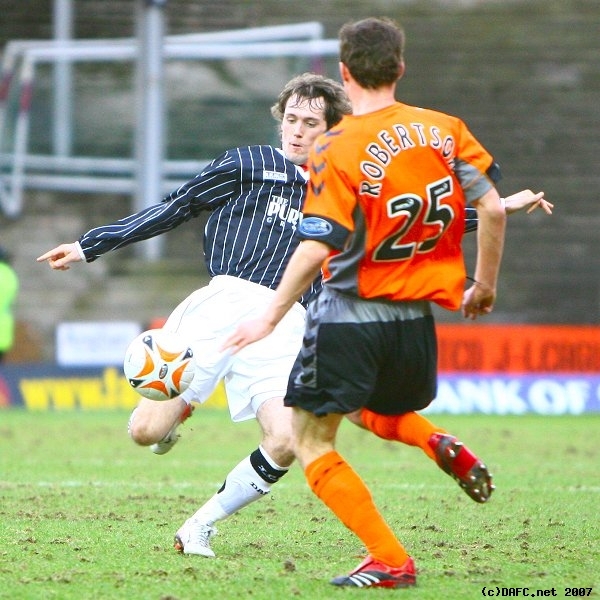 The Pars could not get anything moving forward with too many balls hit at Hamilton who was dwarfed by Lee Wilkie. 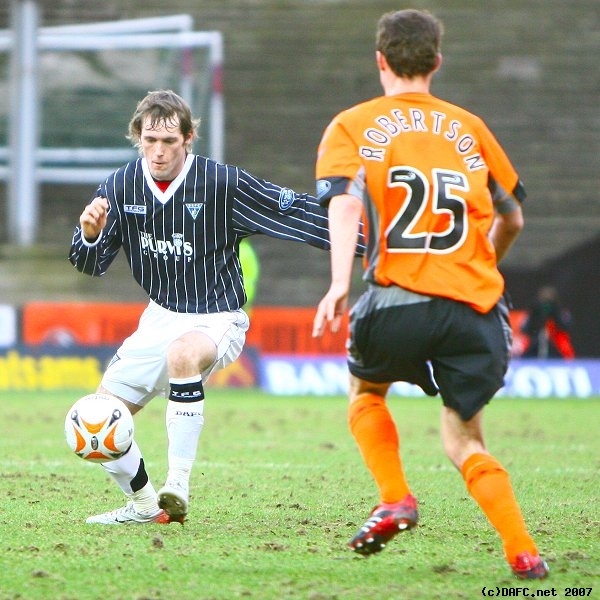 The Pars were finding it hard to string passes together and to be fair United were not much better much of which could be attributed to a very poor playing surface. Once again the Pars were finding the officials were not on their side as Hamilton was booked in 35 minutes for a foul which was probably in that case deserved. When the Pars were going forward a lot of the play was directed through O’Brien but too often he failed to get in a telling cross or took on one defender too many. O’Brien was finding a lot of space on then right but De Vries failed to throw the ball to him opting instead to lump it forward effectively giving the ball back to United. Muirhead took a knock in 39 minutes and later had to be subbed by Adam Hammill. The closest the Pars came to a goal was in 45 minutes when Hamilton turned and shot with the ball wide of Stillie’s right hand post. Half time 0-0. It seemed as if the pattern of play in the first half was continuing into the second. Both sides were closing each other down and neither was able to string consecutive passes together. Adam Hammill looks to do something every time he has the ball but too often he had little support so had to resort to taking on all the defenders near him with no end result. But there was no doubt the youngster was much more effective than Muirhead in that left hand midfield position. Former Pars player Noel Hunt was looking lively, as usual, but as ever (and fortunately) he did not have an end result either. United were looking the more likely side to score and the Pars forays into the United half were becoming fewer and far between. By this time Crawford has dropped back into a midfield role with Hamilton playing up front with O’Brien on his right and Hammill on the left. Hammill was having some success on the left but he was left with few passing opportunities other than long cross field balls to O’Brien on the right. 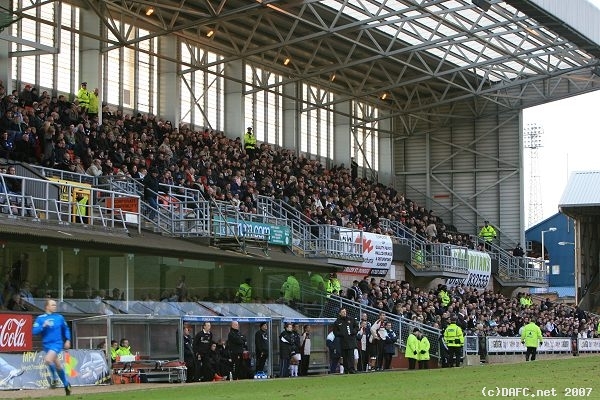 Pars travel up to Tannadice on look out for goals!